Adventures In Negativland: "Thigmotactic" out 7/15, Mark Hosler discusses art and legality at Wham City and HOPE events. Anyone familiar with the long-running culture-jamming subversive audio collage outfit Negativland would not be surprised to hear that the band has gone and challenged itself and listeners for yet another album. However, what’s truly remarkable about its forthcoming new album Thigmotactic is that it’s the first song-based release of its 28-year history. Thigmotactic continues in Negativland’s decades long collage and cut-up tradition, but while the trademark sound of found audio elements is sparingly collaged through-out, the cutting up here is also in the lyrics, created by combining dream journals, bits of advertisements, found poems, automatic writings, stream of consciousness, old National Geographic articles, and more. The fifteen songs and two instrumentals were written, composed and performed by Negativland’s Mark Hosler, with contributions from the rest of the group, and with well-known San Francisco noisemaker Thomas Dimuzio contributing lots of rather unexpectedly normal sounding instruments, arrangements and production. 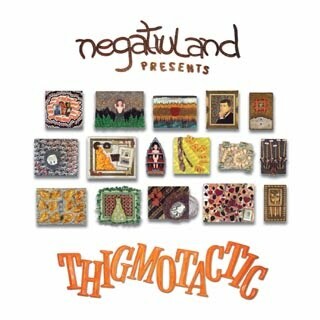 Negativland’s Thigmotactic is out July 15th via Seeland Records and you can sing along for the first time and ponder existential notions to these latest tracks “Basketball Plant” (MP3) and “Influential You” (MP3). Stream the whole record HERE. Over the years Negativland’s “illegal” collage and appropriation-based audio and visual works have touched on many things – pranks, media hoaxes, advertising, media literacy, the evolving art of collage, suburban life, anti-corporate activism, file sharing, intellectual property law, surrealism, the meaning of art and authorship, and artistic and humorous observations of our shared mass culture. Mixing original materials and original music with things taken from corporately owned mass culture and the world around them, Negativland re-arranges these found bits and pieces to make them say and suggest things that they never intended to. This cultural archeology -- call it “culture jamming” (a term Negativland coined way back in 1984) -- has found the band on the receiving end of two lawsuits for copyright infringement. In conjunction with the release week of Thigmotactic, Negativland’s Mark Hosler will be appearing at a couple of special events, providing rare opportunities that are sure to provoke, entertain and inspire both long-time and new-Negativland fans alike. See below for more info. On July 17th at Wham City’s Whartscape, Mark Hosler will share his “Adventures in Illegal Art,” with Matmos, Ultimate Reality, and other Wham City musical guests. On July 20th at the NYC H.O.P.E. conference, Mark Hosler will participate on a “Culture Jamming” panel with TradeMark of Evolution Controlled Creations (LINK) and Tim Maloney (creator of Negativland’s “Gimme The Mermaid” [LINK] and “Aluminum or Glass” [LINK] videos). The Intersection of Culture Jamming, Hacking and Hacktivism: An Overview: Over the past nearly 20 years, the internet has proved to be fertile ground for projects that raise awareness, question authority and inspire social cohesion. Culture Jamming, Hacking and Hacktivism have helped provoke changes in the technical, cultural and political aspects of our society. This panel aims to provide an overview of these techniques through examples of some of the more memorable projects. Starting with the manipulation of voicemail services and leading up to Denial of Service attacks on government webservers, the panel will cover how these projects were organized and executed as well as the reaction that they inspired. The panel will also include a discussion section (with audience participation encouraged) where we will contemplate what use these techniques have in light of the quickly changing internet and digital media landscapes.